Everybody's hair undergoes some changes as a natural part of the ageing process, but if you're worried about hair loss they can be nerve-racking, so it's important to know what to expect. Understanding ageing hair is also important if you're to take care of it in the right way. Good, appropriate hair care, meeting its changing needs, will help to keep many Hair Loss Conditions at bay. Everybody knows that hair usually changes colour as we get older. What you may not realise is that this relates to a subtler change in the shape of the hair that can leave it looking very different. These changes actually begin when we are in our mid teens, with individual hairs gradually becoming thinner. When we reach our fifties and melanin production decreases significantly, this thinning of hairs becomes more dramatic. The single exception to this rule occurs when naturally blond hair turns white, at which point the individual hairs often expand width ways, giving the hair added volume. For everybody else, hair is likely to start looking a bit flat and lifeless. As our bodies are also slower to replace lost hair when we get older, hair can start to look thinner overall, to the point where the scalp is visible through it. The best way to tackle this problem is to choose a haircut that maximises what remains of your hair's natural volume. You can also use volumising products, but beware, as long term use can cause other problems. Of course, many people choose to dye their hair to preserve more youthful colour, but using too many products like this can take its toll on hair not as resilient as it may have been in youth. 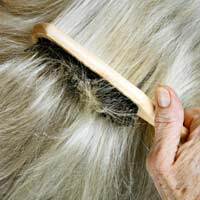 An ageing scalp produces less of the sebum normally used to lubricate hair. This means that, as we get older, our hair tends to dry out. This rarely causes insurmountable problems but it does mean you'll need to change your hair care products accordingly. Switching to a Gentler Shampoo and a moisturising conditioner is essential if you want to keep your hair looking good – and if you want to keep it strong. Dry hair cannot be dismissed as a purely aesthetic problem. It can lead to splitting and breakages, or hair can simply snap under its own weight. Proper moisturising, however, can preserve your hair and prevent you having to cut off length that you would rather keep. Try to give your hair a deep conditioning treatment at least once a month. If you have ongoing problems, protect your hair from rain and apply stay-in conditioner if it gets wet accidentally. When your scalp produces less oil, you won't need to wash it as often to keep it healthy, and washing it too much can dry it out. Experiment to see what suits you. Avoid blow-drying, especially on hot settings, and pat your hair dry with a towel rather than rubbing it. Avoid using hot straighteners or curlers. The other significant problem that occurs with ageing hair is loss of elasticity. This happens as the protein structures within the hair itself become less resilient. You can fortify your hair and minimise the damage by using a protein treatment. There are monthly versions of this available if you can't find one that suits you for regular use. Deterioration in the hair structure happens to most people eventually, but it will happen more slowly if you eat a Healthy Diet that makes sure your hair gets all the nutrients it needs. This is very simple to do – a variety of fruit and vegetables and plenty of water is all you need, and it will also keep your skin looking younger into the bargain.